Also known as Tommy Thompson Park – after Toronto’s first commissioner of parks and the official who peppered them with welcoming “Please Walk on the Grass” signs – this secluded nature reserve is a man-made peninsula extending 3 miles (5 km) into Lake Ontario. More than 290 bird species have been observed in this prime wildlife viewing spot, and its wetlands, meadows, and forests contain many rare and unusual plants. The lighthouse at the southern tip is a common destination for bicyclists. Nature has reclaimed the quarry of this historic former brickworks: the ponds and meadows of what is now known as Weston Quarry Gardens attract birds and wildlife. 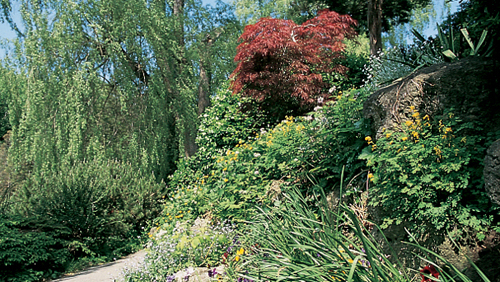 Stop by the world-famous excavated “wall” to marvel at the fossils of Toronto’s early flora and fauna and the region’s geologic history; some of its many layers of deposits are over one million years old . Several miles of bicycle and walking trails meander through formal gardens, wooded ravines, and a rare oak savanna habitat in downtown’s largest park. At the south end is Colborne Lodge and Grenadier Pond, where locals fish in summer and skate in winter . Enjoy a picnic at this lakeside park while watching boats moor, or play a game at the rugby pitch or baseball diamond. At the north end, the Martin Goodman bicycle trail meets the Beach boardwalk . 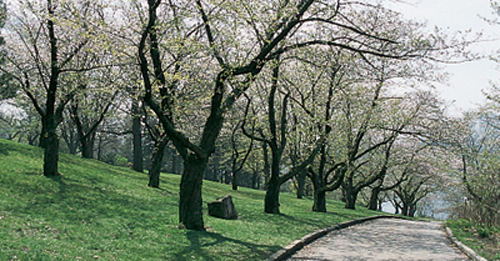 The array of trees – many magnificently old and stately – in this cemetery dating from 1876 qualifies it as a bona fide arboretum. A walk through the lovely grounds will reveal the graves of several notable Canadians, including pianist Glenn Gould (1932–82), whose marker is carved with the opening bars of J. S. Bach’s Goldberg Variations. This gem packs a lot of punch within its compact borders. It is elegantly divided into zones, each with a different theme, such as aspen grove, wetland, and meadow. Jets of mist rise at intervals around conifers; the enormous chunk of Canadian Shield granite makes a perfect perch for summer sunning. Views of the city don’t get much better than those from here. Easily accessible by bicycle on the Waterfront Trail, the park is also great for exploring on foot. Major habitat restoration such as wildflower meadow plantings attracts birds and butterflies . Walkways and interpretive signs complement a series of interesting stormwater cleansing ponds. 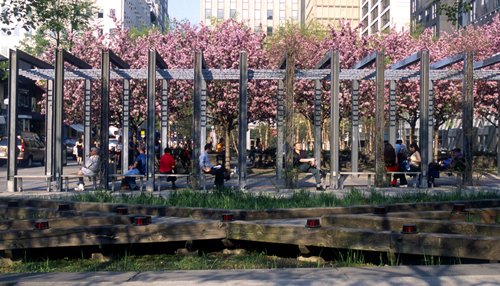 One of the city’s most unusual gardens, each of its six sections is inspired by a movement in J.S. Bach’s First Suite for Unaccompanied Cello. The cumulative effect of swirling paths, undulating hills, and secretive groves is dazzling . 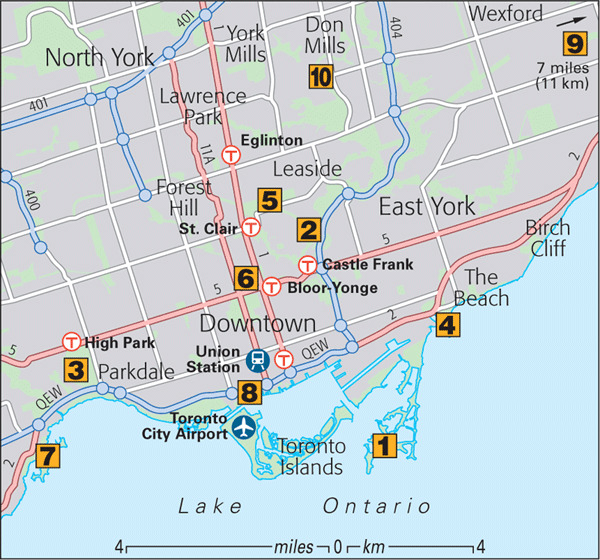 The largest North American park in an urban area – over 31 sq miles (50 sq km) – borders the Rouge River and its tributaries at the city’s eastern edge. It is home to a unique diversity of wildlife and plants, including the best remaining example of a lakeshore marsh in Toronto. You can easily spend a day exploring the trails, either on foot or bicycle . Marvelous flowerbeds showcasing roses, rhododendrons, and much more make this formal oasis very popular in summer, when wedding parties crowd the manicured lawns for photographs. The Teaching Garden lets kids explore an alphabet of plants and learn hands-on about nature. The Toronto Botanical Garden, a horticultural center, is also here.